If you want to improve the appearance of your smile and straighten your teeth but don’t want a mouth full of metal, consider Invisalign®. 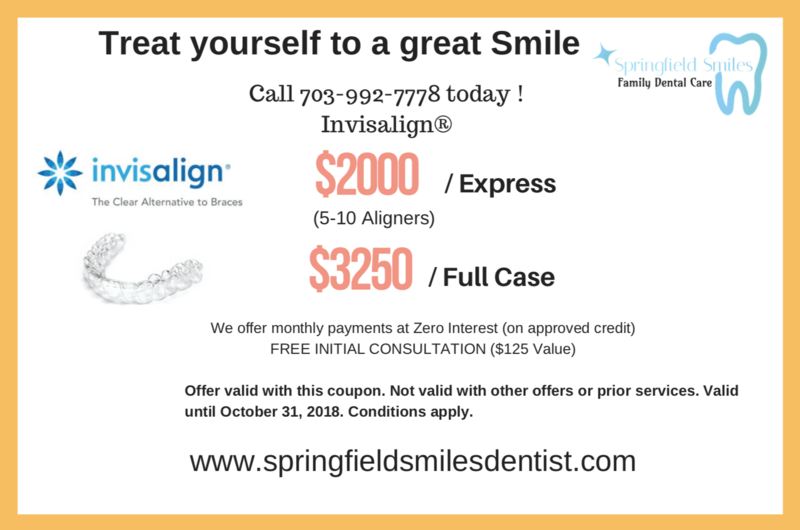 Dr. Soumyata Heggade is a certified Invisalign provider and offers customized treatment to correct the alignment of your teeth from her practice, Springfield Smiles Family Dental, located in Springfield, Virginia. You can make an appointment by calling or scheduling online. Invisalign is an innovative orthodontic treatment that corrects the alignment of your teeth with a series of custom-made, clear plastic aligners. The aligners are made of BPA-free, clear plastic, and are nearly invisible while being worn. The aligners put gentle pressure on your teeth, like the archwire of traditional metal braces, to guide your teeth to corrected positions over a certain period of time. Your aligners are custom-made to fit your teeth and put enough pressure on them to push them through the planned migration to their correct positions. On average, a patient wears 20-36 sets of aligners over the course of 9-18 months. Your treatment begins with a comprehensive exam to determine if Invisalign treatment is the best method to correct your smile. Then, Dr. Heggade takes digital pictures of your teeth, which are used to create a 3D model and a plan to move your teeth to the desired positions. She sends this plan to a lab where your aligners are custom-made for you. You wear each set of aligners for two weeks. For the first four to eight weeks you’ll have bi-weekly appointments with Dr. Heggade to change your aligners, and also so she can check on your progress and make sure your Invisalign treatment is working. Once Dr. Heggade is satisfied that your treatment is going as planned, she will give you two or three sets of aligners, which you change out every two weeks on your own at home. At this point, you have appointments every four to six weeks for Dr. Heggade to monitor your progress and give you the next few sets of aligners. Invisalign treatment offers a wide range of benefits that make it an appealing orthodontic option. For example, the aligners are nearly invisible while being worn, which makes it a popular treatment among adults. You can also take the aligners out to eat and clean your teeth. This means that you don’t have to skip your favorite foods or take special precautions to clean your teeth properly — unlike with traditional metal braces. You must wear the aligners for 22-23 hours every day for treatment to be effective. If you are interested in Invisalign treatment, call or schedule a consultation online today.